Five years old, Very nice looking bird, in perfect feather and health. Name: The Captain. Talks a little. On a good diet. Comes with TWO cages, all his toys, which are many, a table top gym, a large gym, and his carrying cage. $1,000 or B/O takes all. For more information please call Henry at 412-824-4486. 2 Cockatiels for sale-$10.00 EACH - Females - Ages Are From 2 TO 7 years old. 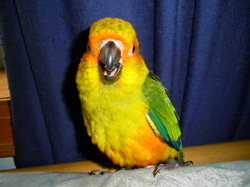 Jessie is our orange wing amazon. She is very social with people. She loves to make noises and loves attention. She is very sweet and needs more time than we can give her. She's a great eater and likes fruits and veggies better than seeds. Peanuts are one of her favorite things. She loves to have her head scratched and would easily attach herself to someone that can give her quality time and attention. She is an entertainer, the more attention-the more her personality lights up. Bandit is our Timneh grey. Bandit is not as social as Jessie. He will need a little encouragement being handled as I am the one he is use to handling him. He has a quick learning ability and says several sentences and words. He is our little chatterbox. When we're in another room, he just talks and talks and whistles. He is developing a great personality and is quite funny to watch. He loves to chew paper and bathes quite easily. He will eat fruits and veggies but also loves his seeds! He also requires more attention than we can gives him. Each bird has their own separate cage and they both enjoy toys and new things with a little time to adjust. 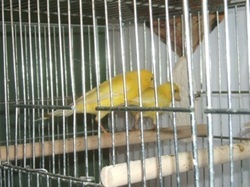 They are both very lovable young birds with many years of companionship to offer the right person. They will only be sold to a great home. We are sadly selling them because they deserve more time and attention than our schedules allow us. We are asking $600 for Jessie and $900 for Bandit. They both come their cages that also have playtop attached. Stormy is a beautiful African Grey! He has been my little sweetheart...up until I met my Husband. My Grey doesn't like to share me and isn't adjusying to another man in my life. My husband and I are looking for a parrot that we can both share. He has been DNA sexed and is male. I no longer have the papers unfortunately. Stormy is very talkative and loves to whistle and make sound effects. He is very smart! He is in supurb health and doesn't have any plucking issues. He is a good, healthy eater as well. I am asking $600 including his nice cage and all accessories. Amarican Singer Canaries - Yellows, Greens and Varigated. From $45 - $80. Various ages. Call Jeff at 412-466-2573 between 8 am - 5 pm, or leave a message.